Good morning everyone! The rain continues and the bugs are more than ever! The stinkbugs taste just as bad as they smell! Uggh! The grass is getting longer and the kalahari is turning into a paradise! The Cats tail’s flowers are slowly making their appearance and the Devils thorn flowers are everywhere! Kali and Luna disapeared for a week with all the rains, but this morning they were back in the riverbed. Oscar has been scarce, probably flirting with another female. The Beach boys are very active in the Kij Kij area and they are your best bet to see lions in the southern region. 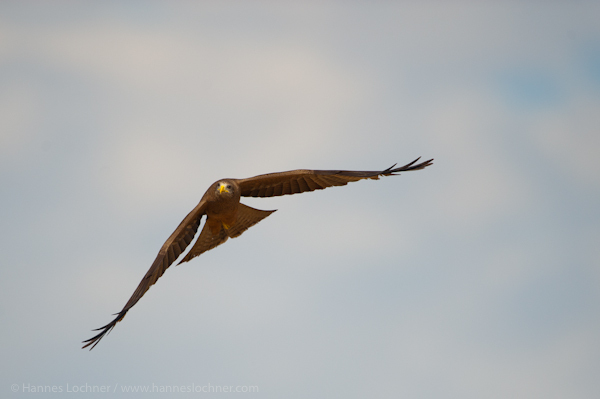 The Yellow-billed kites are in abundance and hunting termites in the air! Great to see these acrobats at work! Enjoy and see you soon! Haven’t been keeping up with you for a while…. Raising my own “cats”…… But love this kite! Really Greg photo! The North is in de freeze and snow conditions so it is really nice to view your pictures for inspiration! Thanks for keeping the blog going. Hoe gaan dit met die meerkatte van die omgewing? Nog net so oulik soos altyd? This entry was posted on 21/02/2012 at 09:51 and filed under blog.lochnerphoto.com. You can follow any responses to this entry through the RSS feed. You can leave a response, or trackback from your own site.